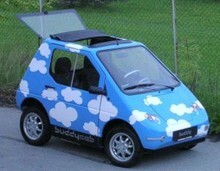 Buddy is the sixth generation of the Kewet electric vehicle. Originally the Kewet was developed in Hadsund, Denmark, and the first model was made in 1991. Production alternated between Hadsund, Denmark and Nordhausen, Germany. During the first five generations over 1000 electric vehicles were produced, . The vehicle was sold in eighteen countries. In 1998 all rights were acquired by ElBil Norge AS (which at the time was called Kollega Bil AS). Bil is the Norwegian word for car, Norge is the Norwegian word for Norway. For some years ElBil Norge further developed the electric vehicle and in the autumn of 2005 a new model was presented that was first called Kewet Buddy Citi-Jet 6, but is now known simply as the Buddy. Buddy is a simple, functional, electric city car with a range of 40–80 km depending on season, topography and driving style. Maximum speed is 80 km/hour. Its length is 244 cm, which means that in some jurisdictions it can be legally parked sideways. The Buddy consists of a strong, hot galvanized steel tube frame, complete with safety cage. The body is made of fiberglass. Other metal parts are treated so that further rust treatment is unnecessary. The electric motor is a 72V SepEx 13kW, a direct current motor with brushes. Well tried technological solutions have used to ensure maximal reliability. Currently, the Buddy is delivered with lead batteries. Completely discharged batteries can be recharged in 6–8 hours. The batteries can be rapidly charged so that one hour's charging allows the vehicle to be driven about 10 km. Charging requires an ordinary, grounded outlet with a minimum circuit of 10 A. The life expectancy for the batteries is expected to be between two and five years, or about 20 000 km, depending on driving and charging habits. A complete battery set costs NOK 19 000 excluding value added tax. ElBil Norge has made a development fleet of Buddy vehicles equipped with various forms of Li-Ion battery technology. When this technology is made available commercially, existing Buddy vehicles will be upgradeable to the new technology. 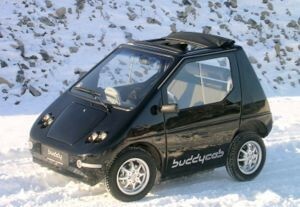 The Buddy is EU approved by the Vehicle Certification Agency as an electric four-wheel motorcycle. It can be used as an ordinary vehicle without restrictions as to the roads it can be driven on, and drivers require only an ordinary driving license. Two models of the Buddy are currently available, the ordinary variety and BuddyCab which features a folding roof. In 2007 the production capacity at Økern in Oslo is 5-6 vehicles a week, with a theoretical production capacity of 500 vehicles annually. To meet international needs ElBil Norge is working to establish new production localities. Despite international interest, the Buddy is currently sold only in Norway while the company prepares for export. As of late 2008, plans were under way for an additional factory in Portugal. The aim is to produce 5000 cars a year.